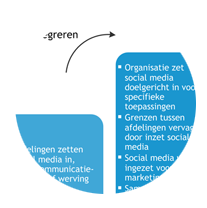 Deze blog is gepost in Social Media Modellen, Volwassenheid met de kernwoorden social media blog, social media maturity model, social media model, social media review, social media volwassenheid, volwassenheidsfase, volwassenheidsmodel door Bart van der Kooi. Hier vind je de permalink. I am looking for a questionnaire that I can use to determine the social media maturity of 17 organisations. Can you perhaps direct me to one? I am currently doing my Masters on social media maturity.